It’s easy to get burnt out on the increasing number of smaller indie games on the market now, and at times it’s difficult to sift through the mediocre ones to find those few standout games that hold their own with big-budget AAA titles. 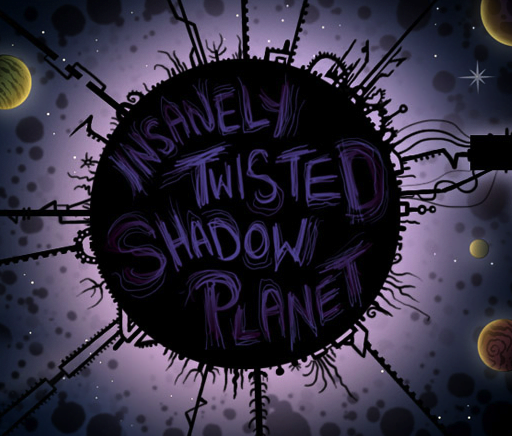 While Insanely Twisted Shadow Planet lacks the depth that some other indie games have, it takes on some classic genres in an interesting way and offers enough surprises along the way to provide an intriguing experience. Insanely Twisted Shadow Planet is a unique mash-up of a dual-stick shooter and Metroidvania-style exploration game. You’ll take control of a flying saucer exploring the depths and heights of the titular planet, taking down the shadowy invaders and indigenous life along the way. There’s not much story here except for a few short cut scenes with little explanation, but ultimately it doesn’t matter much. Throughout the game, your ship will receive upgrades and various attachments that you can switch between at will. The attachments bring new features and abilities to your ship to help you traverse the environment, and some of them, like a laser beam, can also act as weapons. Once you’ve unlocked a handful of these attachments, puzzles will require using several of them within a short span, so it’s fortunate that switching between them is easy. In fact, Insanely Twisted Shadow Planet’s controls are one of its biggest joys. Your ship’s flight feels appropriately floaty while still maintaining a great sense of control, but moving through water or dragging along objects with the saucer’s arm attachment creates a proper sense of drag that simulates the feeling of fighting against a real vehicle’s controls but never ventures into frustrating territory. Adding to the satisfaction of piloting the flying saucer is the game’s sound, which is wonderful in every way. From the hum of the ship’s flight to the echoing of blaster fire in icy caverns, every sound effect feels spot-on. An orchestra swells during the game’s opening and interstitial cut scenes, and ambient music drones on during gameplay, adding to the game’s desolate tone. Though Insanely Twisted Shadow Planet only has a few moments of real challenge, its style will keep you engaged the entire time. The game blends 2D and 3D in an adventurous way, using various layers to bring real depth to the creatures and environments. And at the very moment when you’ve seen everything that one of the game’s five main areas has to show, the map opens up to a brand new one with a fresh new look. In an effort to show off its beautiful environments, Insanely Twisted Shadow Planet takes eschews a typical HUD for more visual cues. For example, your ship’s health is represented by visible damage and your laser glows red-hot when it’s overheating. This minimalistic approach is noble, but the lack of an always-on mini-map is extremely frustrating, leading you to pause and resume constantly when trying to find your way through the game’s twists and turns. Insanely Twisted Shadow Planet’s campaign is relatively short at around four hours, and although there are a few hidden items in the environment that you can’t access until you get some of the later abilities, there’s no real incentive to do so unless you’re an Achievement hunter. Don’t fret about Insanely Twisted Shadow Planet’s brief campaign, though: if you’re looking for value, the Lantern Run provides more than enough. This cooperative multiplayer mode challenges four players locally or over Xbox Live to carry lanterns through nine increasingly challenging battle arenas, all the while being chased by a terrifyingly huge shadow creature. This mode can provide hours upon hours of harrowing fun, and if you can get four buddies in the same room, time will slip away from you as you forge and break friendships through the Lantern Run’s dark corridors. Insanely Twisted Shadow Planet delivers an immensely stylish experience in its single-player campaign, and the satisfaction of guiding your ship through the world’s tunnels should be experienced. And despite the campaign’s short length, the Lantern Run is some of the best couch co-op you’ll find in this era of online-focused multiplayer.